Author Dennis N. Griffin has signed with publisher Geno Munari to publish House Party Tonight, the career of legendary saxophonist Don Hill told in words and pictures. A date in November is targeted for release to coincide with Don Hill’s 91st birthday. For those not familiar with Don, he has been a musician since 1935, when at the age of 14 he played all day on a Mardi Gras float in his hometown of New Orleans for $15. By 1944, he had played with the Alabama State Collegians, Gerald Wilson’s Big Band, Tiny Bradshaw’s Big Band and then toured with Louis Armstrong’s Big Band from 1944-46. During his three years with Louis Armstrong the band toured by train and blacks were only allowed in the car behind the engine, ensuring they would be covered in soot upon arrival. The band appeared in the movie New Orleans, which featured Louis Armstrong, Billie Holiday and Woody Herman. 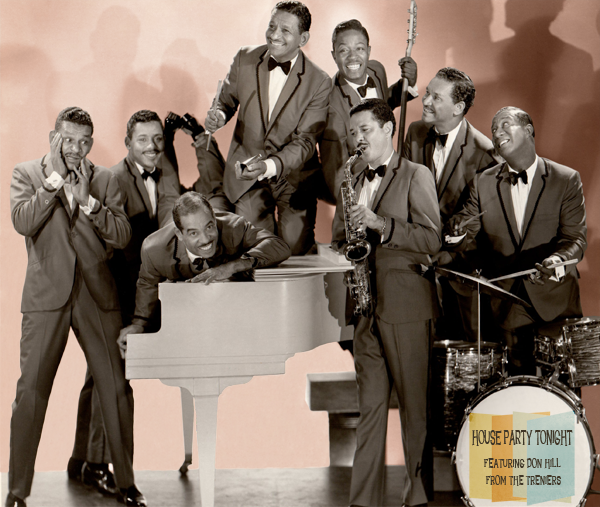 In 1947 Armstrong decided to dissolve his big band and create his All-Stars six-piece combo. At that point Don formed his own band with Buddy Trenier as his vocalist. On Jan. 9, 1948, Don’s rhythm section combined with Buddy’s brothers, twins Cliff & Claude Trenier, and musical director Gene Gilbeaux, to form The Treniers, early pioneers of a new music that combined swing, R&B and rockabilly, to create rock ‘n’ roll. Don’s tenure with The Treniers ran continuously for 55 years, from 1948 until the band’s last performance in Atlantic City in 2003. Dennis N. Griffin is best known for his true crime books recounting the glory days of the Mob in Las Vegas, as well as the true stories of former mobsters including Frank Cullotta (Cullotta) and Andrew DiDonato (Surviving the Mob). Griffin hosts the radio shows and websites of Crime Wire and Real Wiseguys. All the best with your new book, Denny! Knowing your meticulous research and your storytelling abilities… I’m sure it will be a favorite on any coffee table!